Grace Cottage Hospital’s 11th annual Tour de Grace Bicycle Rally will be held on Saturday, July 9. It’s a scenic, mostly-downhill ride for family and friends that helps to raise money for patient care at Grace Cottage Hospital. 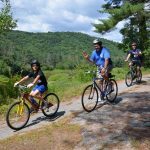 Riders start at Stratton Mountain anytime between 8 and 10 a.m., and ride at their own pace to Grace Cottage Hospital in Townshend. A Tour de Grace 2016 Route Description is available here. Bus transportation is provided to return riders and their bikes back uphill to Stratton Mountain. If you prefer, ask about taking the bus up the mountain first and then riding down. Volunteers will be stationed along the 17.7-mile route from Stratton Mountain to Grace Cottage Hospital to provide free beverages, snacks, and maybe even musical entertainment! Free performance t-shirts will be given to the first 100 riders who sign up. Round up the family, come and enjoy the beautiful scenery, get some exercise, and help support Grace Cottage Hospital! Registration is $25 in advance, $30 after July 5th. You can register at the event. Sturdy tires recommended; helmets required. Call 802-365-9109 with questions. To register, click here.